The following article describes how you should clean your table tennis rubber, and what kinds of cleaners are optimal for doing that. After a brief explanation of which factors contribute to the wear of TT rubbers, we will recommend table tennis cleaners, and we will explain various approaches to extend the durability of your rubbers. How can I protect the rubbers from premature aging? Can the grip of a table tennis rubber be restored? Cleaning table tennis bats - Is water any better for that? A table tennis rubber consists of a catchy (in most cases) upper material exhibiting pimples, and a sponge support. The upper material of the rubber is also called topsheet. Due to various factors (such as dust, solar radiation, oxygen, or moisture), the topsheet ages, as do all rubbers. Additionally, also mechanical stress induced by the ball while playing contribute to the wear of TT rubbers. Hence, in the course of time, you can identify certain wear marks at the surface of the rubber. These negatively influence the gaming properties of your rubber, depending on the degree of wear. Unfortunately, many indoor table tennis facilities are not cleaned properly, resulting in much dirt / particles at the floor. Due to e.g. adhesive forces, these particles stick to the ball after it touches the ground. As you can imagine, in the final step such particles reach your rubber, contributing to its wear. Hence, table tennis cleaners are essential! Fortunately, new(er) table tennis cleaners are not made of solvent-containing substances, as this was the case considering the former spray foams. This is based on a new law, which prohibits the use of solvent-containing cleaners at official games/competitions. Such cleaners considerably influence the properties of the rubber surface, and are also hazardous to your health. Often, the legal and new cleaners are also offered as spray bottles, or combined with an integrated sponge. When applying the cleaner, it is important that the whole surface of the rubber is wetted (however, it is also important not to use too much of the cleaner). Distribute the cleaner evenly, and wipe using the sponge. Do not apply too much pressure. In case you are having 2-3 training sessions per week, cleaning your rubbers is recommended 1-2 times per week. In case you are playing table tennis more often, you should also clean your rubbers more often. There are also measures to protect your TT rubber against premature aging. This is achieved by properly cleaning your rubbers which will remove dust, dirt, and other particles from the surface (see above). This prevents negative effects, and protects from premature aging. The most common form of cleaners are pump sprays. 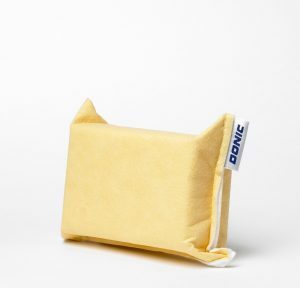 A particularly noteworthy cleaner for your rubbers is the Donic Bioclean cleaning spray, which does not contain organic solvents. 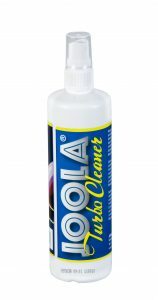 After the training, you simply apply this cleaner at both sides of your racket, and dry it using a cleaning sponge. After this, it is recommended to use protective films / foils. These should only be put on clean and dry rubbers! To protect your rubbers from solar radiation (particularly UV-radiation), and to ensure a safe storage, we also recommend a racket suitcase, or a bat case / bat wallet. There is a brief answer to this question: No. But, you can significantly delay the aging process of table tennis rubbers, and increase their durability. As already mentioned, this is achieved by a proper care! For cleaning the rubbers, please do not use your hands. The skin of your (palmar) hands always contains a thin film of "grease" and other particles, which are then negatively affecting the properties of your rubbers (e.g. less friction). In most cases known to us, and in which table tennis rubbers wear off very quickly, there was a wrong treatment and/or inappropriate storage. Often, the influence of moisture is underestimated, too. Hence, basements / cellar rooms with a bad insulation, a high humidity, and large temperature fluctuations (often too cool) negatively contribute to the wear of TT rubbers. But also a frequent, direct, and intensive solar radiation shortens the life span of a rubber. By the way: You don´t need to clean your rubbers in each pause during the sets. This is useless, and merely increases the consumption of the cleaner. Often, we can observe that players breathe on the table tennis paddle, and subsequently wipe it with the hand during the game/training. Or: In some cases, the rubbers are only cleaned using pure water. Both approaches are not effective, and usually even deteriorate the gaming properties of your rubbers. As already mentioned, especially when wiping with your hand, a thin film of grease is transferred onto the surface of the rubbers, making them way more slippery. Also the cleaning using pure water does not remove grease and all of the other particles. Real table tennis cleaners, however, do. Tip: During longer breaks, we recommend you to use protective films / protective foils. These prevent moisture, dirt, and other particles from getting in contact with your rubbers. Hence, the durability and positive gaming properties are maintained! Please note that self-adhesive foils are only suitable for "normal" rubbers with pimples in. 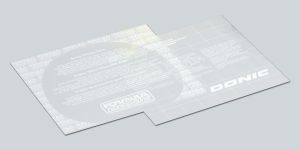 Protective foils /films, which are not self-adhesive, are suitable for sticky table tennis rubbers. 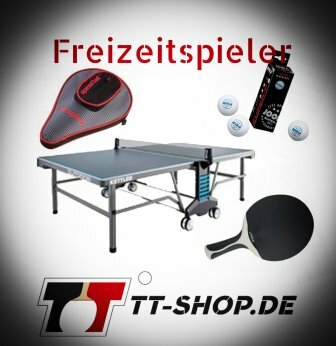 We recommend that for only little money, every TT player should get a small basic equipment around the topic care of table tennis rubbers. 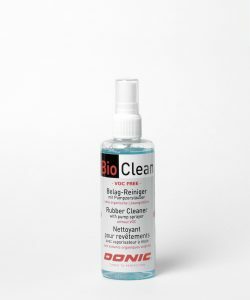 The table tennis cleaner "Donic Bioclean" is available for only 3.45 Euro (125 ml bottle). Also, we provide attractive offers regarding care kits / care sets. 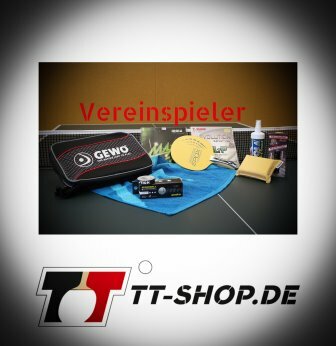 At this point, we would like to recommend our table tennis cleaning set, appropriate for bats and rubbers. This cleaning set contains a bat case/wallet, a cleaner, and a cleaning sponge. The cases are in stock, and we are convinced of their good quality. By using such a racket case, and also due to a regular usage of the cleaner, you can enjoy your rubbers for a considerably longer period of time! This, of course, also positively influences the results of your games, and saves money. 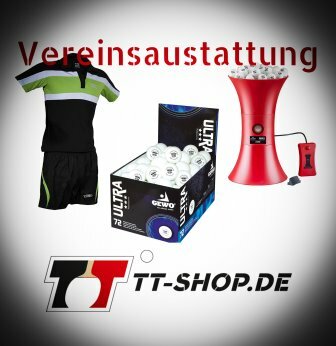 Regarding the structure of our shop: In terms of the topic cleaners, protective films etc., we have created a separate category.